Synopsis: THE HUGO AND NEBULA AWARD WINNING NOVEL Orson Scott Card’s beloved classic Ender’s Game is now a major motion picture. Andrew “Ender” Wiggin thinks he is playing computer simulated war games; he is, in fact, engaged in something far more desperate. Ender may be the military genius Earth desperately needs in a war against an alien enemy seeking to destroy all human life. The only way to find out is to throw Ender into ever harsher training, to chip away and find the diamond inside, or destroy him utterly. Ender Wiggin is six years old when it begins. He will grow up fast. 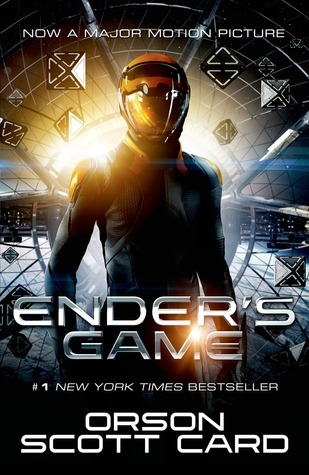 “Orson Scott Card makes a strong case for being the best writer science fiction has to offer.” —The Houston Post This movie tie-in edition features cover art from the Summit Entertainment film starring Harrison Ford, Ben Kingsley, and Asa Butterfield as Ender Wiggin. My review: I was first heard about this series when the trailer came out for the book and then recently my friend told me that I had to read it. I have to admit I had some trouble getting into the story. I was a bit confused about the world and there was a lot that wasn’t explained. It’s one of those stories that I sometimes feel I’m entering into way too late, and that a prequel would be extremely helpful in understanding certain components of the story. Nevertheless, I did learn more and more about the world Ender was in as the story progressed and what his purpose was for the entire universe. I liked the sci-fi world that surrounded Ender (that which was explained to me). I found Ender to be an…interesting character. I didn’t dislike him, but he could get on my nerves sometimes. I understood that he was just a kid growing up in this world where he wanted to be no part of, but he could have chosen not to go to the intergalactic school! Obviously, as a young boy he had a lot of problems with being picked on, which was something else I couldn’t really relate too. I wish there had been a dual-focus on the other side of what was happening. Of course we saw what was happening up at the school with Ender, but I wish we could have learned more about what was going on down on Earth with the rest of civilization, especially with people like Ender’s siblings, who were also trying to make a difference in the world like Ender. Overall, the ending (no pun intended) really saved this book for me. If the end wasn’t as good as it had been I probably would have rated this at least a three star. Nevertheless, four stars from me, but I don’t think I’ll be continuing on the series. Sidenote: I don’t normally like movie tie-in covers but I absolutely love this one!